By Orla Stafford | December 3, 2013. Public transport users have been struck another blow as bus, rail and Luas ticket prices have increased yet again. The National Transport Authority (NTA) confirmed a hike in ticket prices on public transport services including Bus Éireann, Dublin Bus, Iarnród Éireann and the Luas. According to the NTA, in order to “protect service delivery”, monthly, annual, and tax-saver tickets had to be increased from 1st November while cash, Leap cards and pre-paid tickets soared in price from 1st December. A reduction in Government payments to main public-transport companies added to the need for price hikes. Holders of monthly and annual tickets are reported to have been hit the hardest. The NTA revealed that prices on the DART were to be increased by more than eight per cent while Dublin Bus fares rose by 9.3 per cent to 10.3 per cent. Bus Éireann tickets had an additional six per cent added onto their costs. 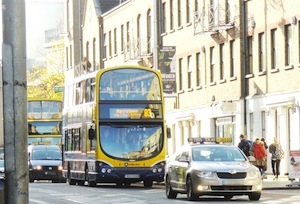 From 1st November, annual and monthly ticket prices for Dublin Bus and Dart soared by 10 per cent. Leap fares on Irish Rail and Dublin Bus increased by just 3 per cent from 1st December. The biggest blow to commuters was the increase to Irish Rail short hop zones and Dublin Bus fares for over 13 stages. The NTA is encouraging all commuters to purchase a Leap Card over paying cash as the cards work out considerably cheaper. Information on the adjusted fares is available on the NTA website detailing the amendments and the reasons for them.